Global top 10 smartphone brand Coolpad is launching its 2016 global flagship smart phone the Coolpad Max in multiple countries. The Coolpad Max features the world's first Dual Space feature paired with an elegant design. Coolpad Max first launch event in Grand Ballroom, Ritz-Carlton Hotel, Indonesia with more than 1000 attendees. Coolpad, a global smartphone brand with more than 20 years’ experience, officially launched its 2016 flagship the Coolpad Max smartphone today. The Coolpad Max will be available in numerous markets, including Indonesia, Vietnam, India and Europe. The Coolpad Max launch events will be held in multiple countries, celebrating with local media and partners about this exciting milestone in Coolpad's history. 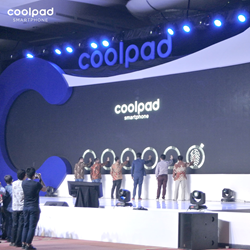 The events kicked off at the Grand Ballroom, Ritz-Carlton Hotel, with approximately 1,000 attendees, including Coolpad's CEO and media from the Asia Pacific. Launch events will follow in India and Europe over the next several days. Coolpad Max comes with the World’s First Dual Space feature, which enable users to separate their personal and professional life, without the need to use two different smartphones. Dual Space also allows its users to have two accounts for WhatsApp, Facebook, Line, BBM, and other social media applications in a single smartphone with a BiLogin feature. The embedded encryption technology provides solid protection for different sides of your life. Any data, contacts, photos, videos, and applications are securely stored in two spaces. Performance is assured thanks to the advanced Qualcomm Snapdragon 617 MSM8952 1.5 GHz 64 bit Octa-core processor with 4GB RAM for a fast user experience. With the reliable Qualcomm Quick Charge 3.0 technology and 9V/2A charger, users will get more than 2 hours talk time with only 5 minutes of charging. At just 7.6mm thin and weighing only 170g , the Coolpad Max brings you great entertainment experience with 5.5 inches FHD display with 1500:1 contrast ratio and 95% color gamut. In addition, Coolpad also pinned the Edge Curved Glass 2.5D screen reinforced with Corning Gorilla Glass 4 anti-scratch and anti-fingerprint coating films. With a Full Metal Unibody Chassis design and two color variations, Gold and Rose Gold, Coolpad Max offers a premium design for global market audience. Sleek, stylish and a comfortable fit in the hand, The Max feels as good as it looks. 97% of the Coolpad Max’s material is made of pure metal. Coolpad utilizes highly precise 54 processes 10 CNC Milling to ensure its durability. There are thin 1.4mm dual-antenna line (thinner than other smartphones, i.e. 2.0mm) on the chassis used on the smartphone. This design makes a stronger signal transmission up to 60% and provides a better mobile signal reception up to 30%. Coolpad holds 13 patents in developing this Tridimensional Coupling Antenna technology. Coolpad Max features 13 MP rear camera and f/2.0 lens armed with ISOCELL CMOS technology to bring lighter but less color inference. 6P lens minimize the color distortion to produce a brilliant photo. It also supports PDAF (Phase Detection Auto Focus) to ensure faster focusing. The Dual Tone LED makes your skin look more natural. Coolpad is taking advantage of the latest fingerprint technology in the Coolpad Max to deliver a convenient, secure, and reliable experience for their users. The fingerprint technology allows a user to be able to unlock the phone with their finger. Additionally, a user can configure the Coolpad Max to perform many more functions with a gesture of their finger, such as opening specified apps and capturing pictures. With the innovated Dual Space feature, Coolpad Max is able to address current office needs for separating personal and professional life. Without carrying two smartphones at once, the dual space enables users to have complete different apps, accounts and data by logging in the respective space. For the budget users, Coolpad also releases Coolpad Max Lite, comes with a symmetrical design made of aluminum material titanium that can maintain the durability and increase user comfort. This smartphone is powered by a MSM8929 1.4GHz 64bit Octa Core processor with 3GB RAM capacity, to deliver similar performance with Coolpad Max. The 5.5 inches HD display with 2.5D Scratch-resist glass lets users enjoy their videos and pictures in the finest detail. Coolpad is delighted to announce the signing of Chicco Jerikho as its new Brand Ambassador. The award winning actor already featured in a new integrated campaign for Coolpad which will run across TV, print and online channels as well as in-store – rolling out from April 2016. Coolpad, one of the top smartphone brands in China, was designed and established by Yulong Computer Telecommunication Scientific (Shenzhen) Co., Ltd. (“Yulong Telecommunications”). Founded in April 1993, Yulong Telecommunications went IPO on the Hong Kong stock market HKEx in 2004 under the name China Wireless Technologies group (stock trade code: 2369), later changed to Coolpad Group. With 6 R&D facilities worldwide, the company continues to invest heavily in developing innovative cellular, wireless, and mobile technology products. Coolpad has become one of the top cellular device manufacturers in the world and was recently ranked 7th largest smartphone OEM by IDC. Coolpad has been recognized with many industry accolades, including a recent ranking of #342 on the China Fortune 500 company in the annual 2013 list by FORTUNE 500 CHINA Magazine. Coolpad also ranked 47th on the China top 100 Electronics & Info Enterprises list. Coolpad is committed to consistent future success, which we believe will come in the form of building a powerful global juggernaut out of their flagship Coolpad brand. Empowering everyone everywhere is Coolpad’s vision in the coming years.